A key priority for Sierra Poetry Festival is that our youth have an opportunity to grow and thrive – either through poetry recitation or through the simple enjoyment of listening to poetry read by some of our most eminent poets. Our youth can enjoy mainstage readings, attend workshops, and participate in the free fringe festival poetry pop-up events that take place all the way through National Poetry Month. Our festival tickets for youth are offered free of charge. Support Youth Voices in Nevada County with your donation. Poetry Out Loud encourages high school students to learn about great poetry through memorization and recitation. This program helps students master public speaking skills, build self-confidence, and learn about literary history and contemporary life. Since 2005, Poetry Out Loud has grown to reach more than 3 million students and 50,000 teachers from 10,000 schools in every state, Washington, DC, the US Virgin Islands and Puerto Rico. In Nevada County Poetry Out Loud starts in classroom level led by teachers, with additional teacher and student guidance, coaching and mentoring offered by professional teaching poets registered with California Poets in the Schools under the umbrella of Nevada County Arts Council. Student winners advance to a school-wide competition, then to a regional and/or state competition, and ultimately to the National Finals. Nevada County Arts Council offers participants the chance to present their pieces at Sierra Poetry Festival to friends, family, peers, and new audiences. You can learn more about Poetry Out Loud here. We also offer middle school students the opportunity to present poems of their choice at the Sierra Poetry Festival. In early spring, our teaching poets attend Nevada City School of the Arts 8th Grade Poetry Slam to select interested young poets who are then offered coaching prior to the festival, and during select events during our pre-festival pop-up poetry events. Dream a Difference began in 2016 as a poetry project connecting small schools in the United Kingdom with others in Jordan, Palestine, Malaysia and Zimbabwe. During 2018, Nevada County Arts Council piloted this program in the United States and, during 2019 will again partner with Twin Ridges Schools District to coach children in poetry at Washington and Grizzly Hill Schools. Washington and Grizzly Hill Schools are situated on the Western Slope of the Sierra Nevada. Deeply remote and forming one of the smallest school districts in the US, students form part of an emerging global community of young people who are gaining awareness and learning empathy for the way others live and, in the spirit of sharing the poetry they write in the form of song and recitation, will share their own experience of life in rural California. 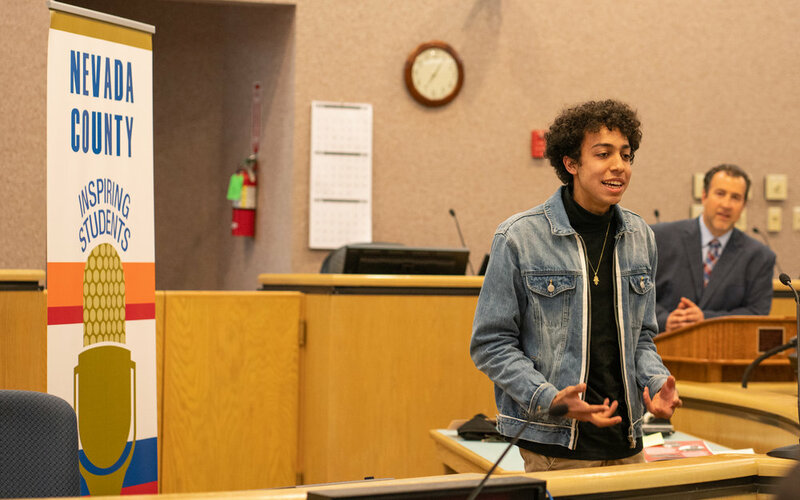 Students at these schools are also offered an opportunity to recite their poems at the Sierra Poetry Festival which takes place during national poetry month each year. Here they meet our Poetry Out Loud participants, gaining valuable foundational insight and preparation towards this nationally recognised high school program. You can learn more about Dream a Difference here.